Jobs always insisted that this edge was merely being “honest.” If something “sucked,” he must tell you to your face. That Southern socio-cultural character flaw of habitual dishonesty — in which we would rather play nice than tell the truth — was no temptation to the west coast Steve Jobs. In addition to his famed tirades was Jobs’ “reality distortion field.” Jobs would draw a picture of the world that seemed to defy all reality. At worst, he simply lied. At best, he cast a vision of what could be and then got others caught up in making that vision a new reality. He was different. His difference and his impatience enabled him to get others to do things they never thought they could do. His difference and impatience enabled him to found and develop a company that became the most monetarily valuable company in the world. Jobs once said in an interview that one who had never dropped acid could never understand him. The early years of LSD use apparently contributed to a “different” view of the world. So did the cultural upheaval of the 1960s, and Jobs’ trek through India seeking enlightenment. In Isaacson’s convincing telling, this “difference” plays prominently in Jobs life-journey, both in the way he sought to develop products and do business. And he was undoubtedly a genius — an artist, Isaacson notes, who wanted to make great and beautiful products driven by intuitive flashes of insight, who knew that technology must be informed by the humanities, and an entrepreneur who found grossly distasteful the business-person desiring the goal of “making money.” Jobs insisted that he was not interested in “making money” but “making great products.” “Making money” must serve the goal of “making great products,” not the other way around. This sort of difference is much to be praised. But I wish his genius had been formed eschatologically. By “eschatology” we need not mean “after life” as much as “point to life,” the rightful goal of life. The difficulty with Jobs’ “difference” was not that he saw the world differently. It was that the “difference” was not driven by what the theologians or the philosophers call a “thick conception of the good.” It was that his “difference” was not really all that different, after all. “Eschatology,” in the best Christian and Jewish traditions, is not simply about “life after death,” but about “setting things to rights,” about the broken creation being made whole, about “new heavens and new earth,” in which swords are beaten into ploughshares and spears into pruning hooks, in which the powerful share power with the powerless, in which the mighty use might in service to justice. This is why I found so fascinating Jobs’ own fascination with Bob Dylan: Dylan repeatedly employs the Hebraic and Christian eschatological notions of hope, of injustice overthrown and change coming. If I could rewrite just one element of Jobs’ story, it would be that he would have paid more substantive attention to Dylan. Jobs’ wife Laurene Powell said that her extraordinarily gifted husband, in spite of his significant shortcomings, “cares deeply about empowering humankind, the advancement of humankind, and putting the right tools in their hands” (543f). But tools and advancement necessitate some end or goal, some purpose or telos. “Advancement,” in other words, requires some sort of eschatology. Otherwise, “advancement” is a meaningless idea. Jobs’ interest in Buddhism and his early consumption of LSD seem not to have provided him the needed eschatology. In spite of his critiques of western culture; in spite of his criticisms of the mindlessness of the mere “making of money”; in spite of the fact that he rightly saw that such “bottom line” thinking corrupts art and beauty and the insights of the humanities; in spite of all this, I found lacking in Isaacsons’ biography the fact that the humanities — at least prior to the Enlightenment — insisted that art and beauty and philosophy must grapple first and foremost and always with the true end of humankind. Otherwise, there can be no substantive notions of art or beauty or wisdom. Thus, against Jobs’ own very best intentions and insight, Dylan’s emphasis upon “change” and “difference” becomes a fantastic marketing plan in Apple’s world. Dylan proclaims the overthrow of historical forces of injustice and the up-ending that comes with the Kingdom of God when he sings that “The times they are a-changing.” The “loser now” who is cast aside and trampled upon by greed and hostility and prejudice will be “later to win.” For Jobs, “the times they are a-changing” becomes a refrain that befits the unveiling of the MacIntosh (207). 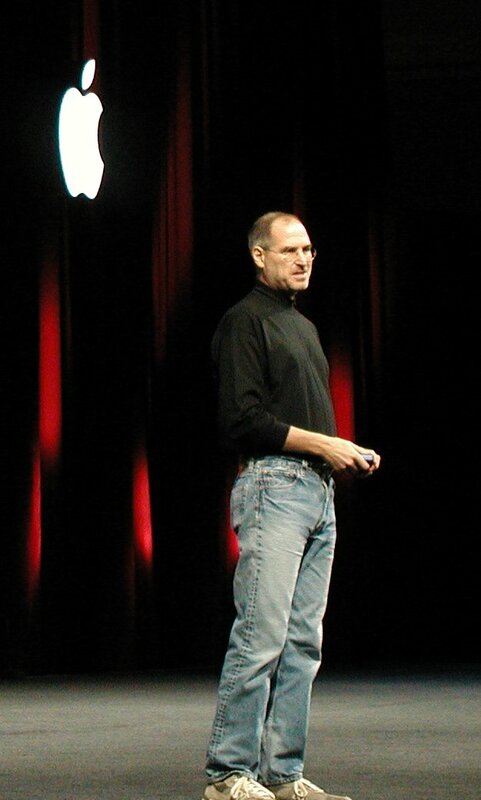 With a substantive eschatology that can withstand the onslaught of commodification and individualization of all things, perhaps Jobs’ famed impatience could have been driven by an even deeper, even more honest, “reality distortion field” rightly ordered toward the “different” liberating, just and peaceable reign of God. Without such a substantive eschatology, “difference” inevitably falls prey, too, to commodification and the corruption entailed in mere profit-seeking. In the absence of some eschatology, Apple products devolve merely into brilliantly devised, individualized, if not narcissistic, modes of being: the solitary soul — or perhaps more telling, a mere silhouette of a solitary soul — dancing alone, with ear buds and iPod. Published previously on Huffington Post.